If you have already applied for your presentation, register to the meeting by following the procedure below. If you have not applied for your presentation yet and don't have your meeting's MYPAGE, register to the meeting by following the procedure from here. Go to the registration page by clicking "Register" at "Registration Information" in meeting's MYPAGE Top. Click "Confirm Information Entered" after you have entered your registration information. Choose whether to register or not register to the annual meeting. * Only people who wish to buy collection of papers or the program without making registration can choose not to register. Choose the perks of registration you need. Choose the options you need buy in addition. Choose whether to register or not register to the Get-Together. Choose "Member", "Non-member", "Foreign Nationality - Regular" or "Foreign Nationality - Student." It will appear if you chose "Member" above. Here, choose your member classification. 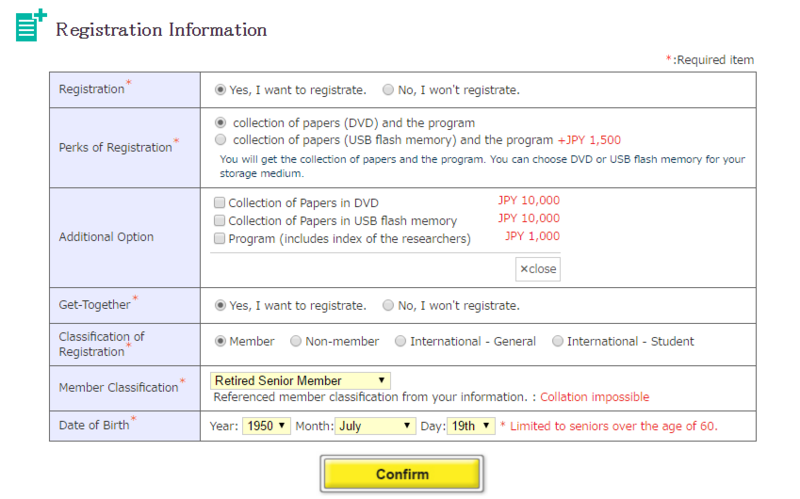 It will appear if you chose "Retired Senior" above. * Retired Senior membership is limited to seniors over the age of 60 who are retired. It will appear if you chose "Corporate" above. Enter the No. for CSJ. It will appear if you chose "International - General" or "International - Student" above. Select your nationality. 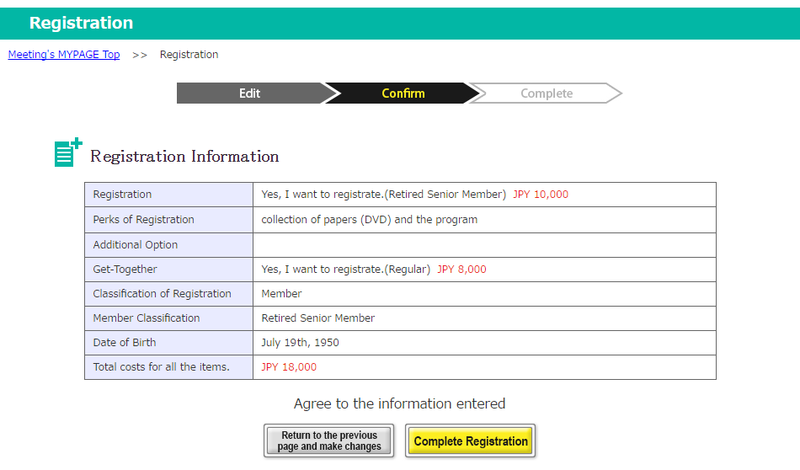 Click "Complete Registration" after you have confirmed your registration information. Your registration for the annual meeting has completed. 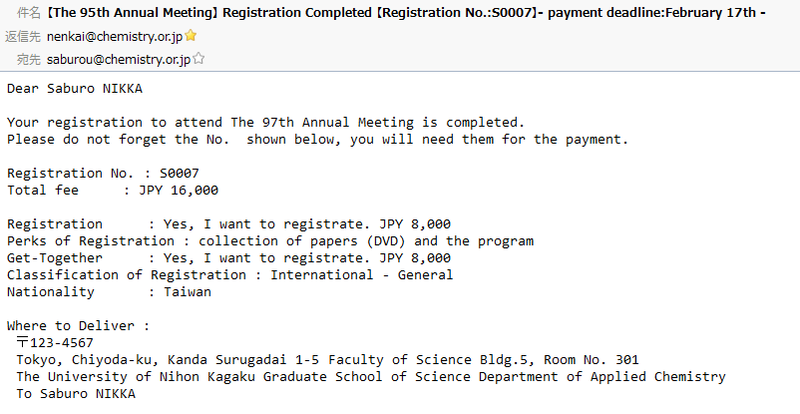 You will receive an e-mail titled "Registration Completed." How to confirm or edit your registration to the meeting. 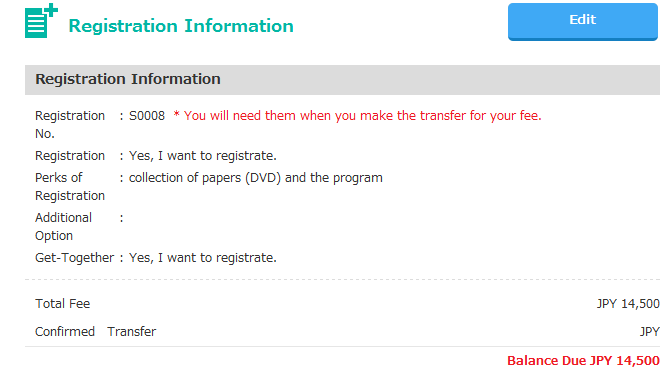 Information you entered will reflect in "Registration Information." Click "Edit" at "Registration Information" if you need to edit your information.